In this paper we study the Optimal Cost Chromatic Partition (OCCP) problem for trees and interval graphs. The OCCP problem is the problem of coloring the nodes of a graph in such a way that adjacent nodes obtain different colors and that the total coloring costs are minimum. In this paper we first give a linear time algorithm for the OCCP problem for trees. 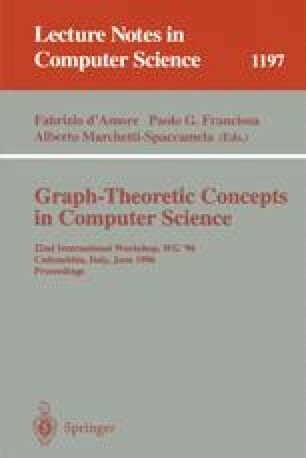 The OCCP problem for interval graphs is equivalent to the Fixed Interval Scheduling Problem with machine-dependent processing costs. We show that the OCCP problem for interval graphs can be solved in polynomial time if there are only two different values for the coloring costs. However, if there are at least four different values for the coloring costs, then the OCCP problem for interval graphs is shown to be NP-hard. We also give a formulation of the latter problem as an integer linear program, and prove that the corresponding coefficient matrix is perfect if and only if the associated intersection graph does not contain an odd hole of size 7 or more as a node-induced subgraph. Thereby we prove that the Strong Perfect Graph Conjecture holds for graphs of the form K×G, where K is a clique and G is an interval graph.